I have been doing a lot of synchronization projects lately like SalesForce events and Google Calendar Events, Active Directory and some Payroll Application and now Google Groups and Active Directory Groups. It may sound too complicated to develop but trust it is not as complicated as you think. For this article I will be presenting you a working code one way group membership synchronization that you can start with. I hope this post will show you the concepts needed to achieve our end result which is synchronizing members in Active Directory and Google Groups. Before you get started I am assuming that you have Google Apps for your domain already setup and running for your organization otherwise you need to have it first before proceeding. Now let’s get started, first you need to download the Google Apps .Net Client Library which you can find here. Once downloaded set it up then were ready to roll. 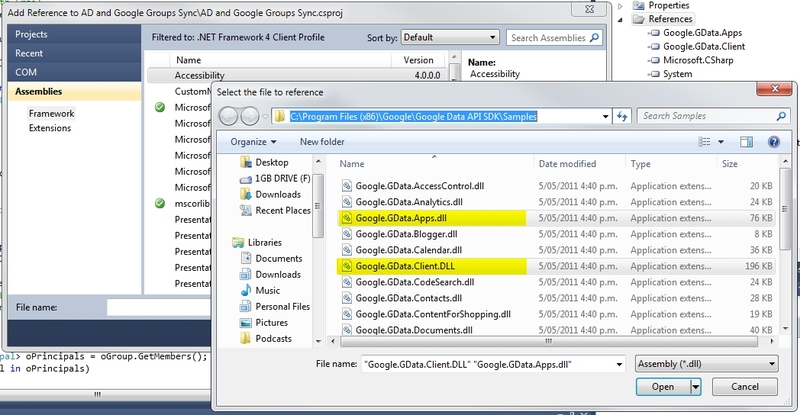 Fire up your Visual Studio and add the following dll’s (Google.GData.Apps.dll and Google.GData.Client.dll) from the installed Google API folder, you will also need System.DirectoryServices and System.DirectoryServices.AccountManagement which can be found in the Assemblies repository. We also need a method to Initialize Google Service, take note I had also included methods for using proxy servers. Here are some Active Directory Methods that we will use, these are all derived from my AD Methods Library which can be found here. You also need to extend the GroupPrincipal Class to expose the Email address field so that we can easily refer to it. By default Email Addresses are not exposed in the GroupPrincipal and here is the full article explaining how to extend the GroupPrincipal Class to expose values not represented in the GroupPrincipal. 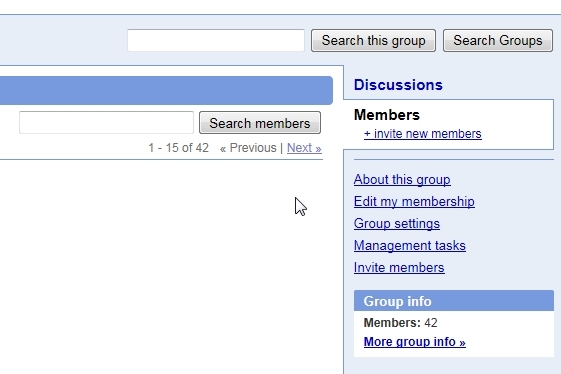 On the Next Article I will be expanding further on that CreateGoogleGroup function. Happy Coding! Doesn’t Google apps directory Sync already do this? Yup I know that tool but I am just showcasing this code for those who wants to know how to do it on the API side, it will be useful if you need some bespoke functionalites not supported by the tool. we have AD on public IP and we could able to pull and push users through SAML from our c# code. we also have google apps account. while trying to synchronize AD and Google Apps through above code, its throwing principalclassreference error. need help.